William Blake’s work demonstrates two tendencies that are central to social media: collaboration and participation. Not only does Blake cite and adapt the work of earlier authors and visual artists, but contemporary authors, musicians, and filmmakers feel compelled to use Blake in their own creative acts. This book identifies and examines Blake’s work as a social and participatory network, a phenomenon described as zoamorphosis, which encourages — even demands — that others take up Blake’s creative mission. The authors rexamine the history of the digital humanities in relation to the study and dissemination of Blake’s work: from alternatives to traditional forms of archiving embodied by Blake’s citation on Twitter and Blakean remixes on YouTube, smartmobs using Blake’s name as an inspiration to protest the 2004 Republican National Convention, and students crowdsourcing reading and instruction in digital classrooms to better understand and participate in Blake’s world. 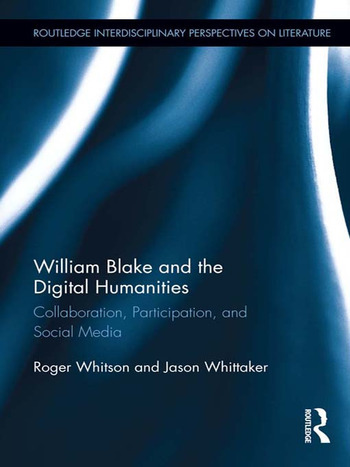 The book also includes a consideration of Blakean motifs that have created artistic networks in music, literature, and film in the twentieth and the twenty-first centuries, showing how Blake is an ideal exemplar for understanding creativity in the digital age. Jason Whittaker is Professor of Blake Studies at University College Falmouth, UK. Roger Whitson is Assistant Professor of Nineteenth-Century British Literature and the Digital Humanities at Washington State University, USA.